The ride and handling of the Sniper was impressive. It certainly looked at home at Lake Mulwala. 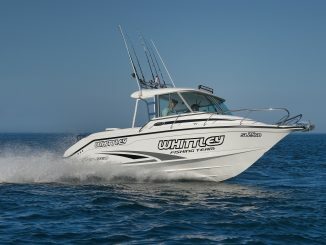 Anglapro has a reputation for producing boats that are firmly targeted at anglers and their specific needs. 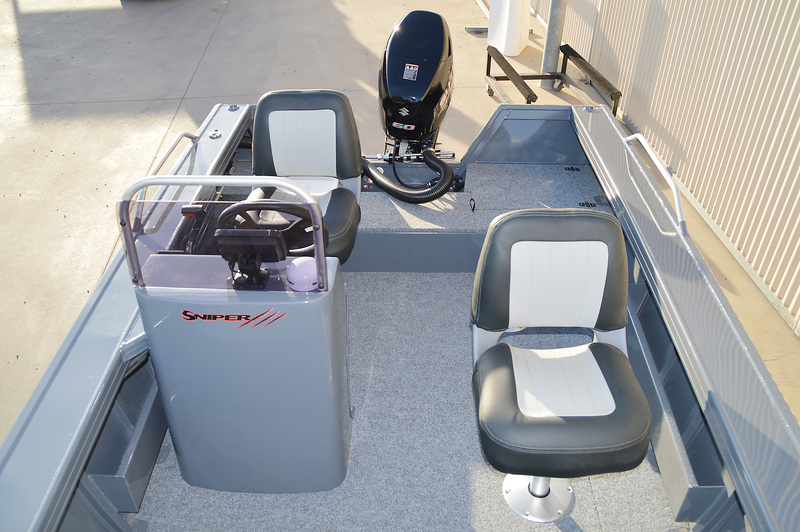 The layout of the boats has been refined over the years, so many of the features that anglers look for are already in place – all you need to do is add the electronics and smaller options to make it your fishing boat. 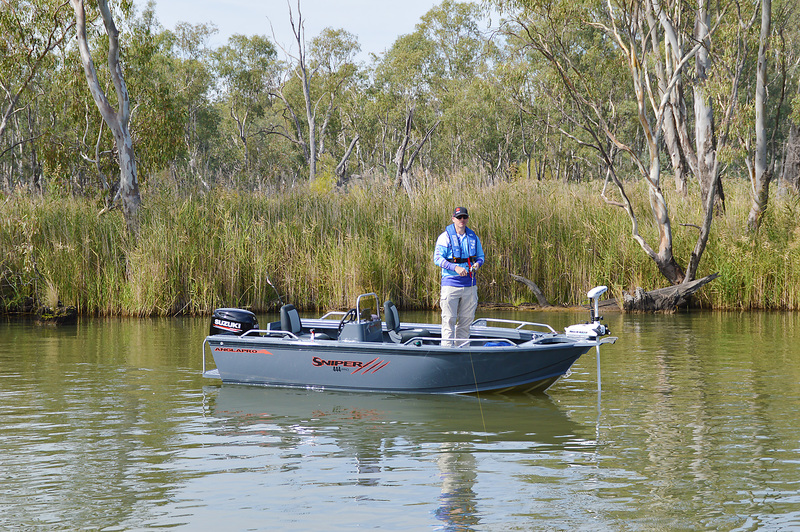 I have tested a number of Anglapro boats over the years, but this is my first look at one of the Sniper series models from the range. Aimed directly at the sportfishing market, the Sniper 444 Pro is 4.5m long with 3mm side and bottom sheets. The maximum horsepower is 60hp, with a minimum of 40hp. 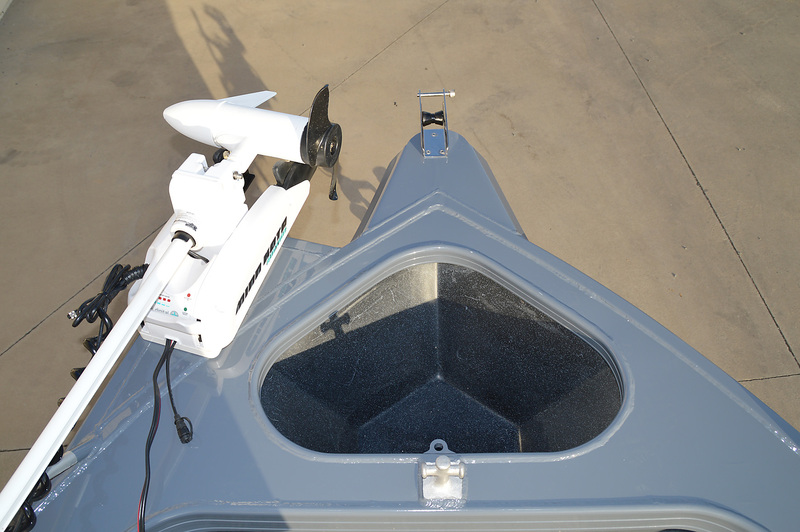 Although its focus may be for inshore waters, lakes, estuaries and impoundments, it does have a 550mm freeboard, which means that in good weather you can spread your wings and fish further afield. 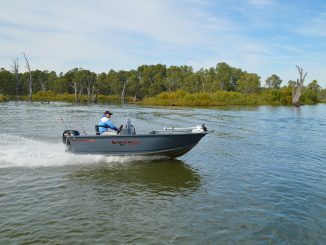 I joined Simon Ryan from Boats and More in Shepparton and Echuca at the top end of Lake Mulwala to put it through its paces. It’s always nice to know that everything you would like in a boat doesn’t have to be an optional extra. That certainly is the case with the Sniper 444 Pro. Standard inclusions are a white painted hull (inside and out), extended forward and rear casting decks, a fully carpeted floor, a front kill tank (which can be plumbed) and an electronics pack. 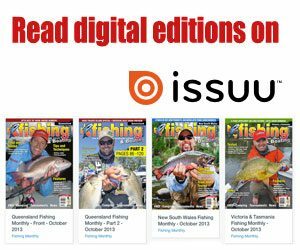 Although all the above are essential for a boat to be used as a lure casting platform, Simon and his team understand that ultimately there are a few other items that provide that little bit more, and had added them to the boat we tested. 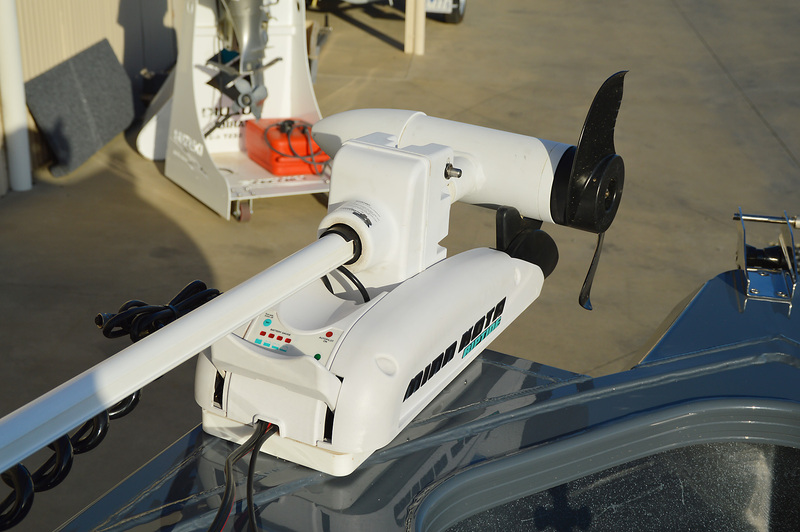 These included a Minn Kota electric motor and mount, with a battery and charger storage system underneath the front casting deck. They also upgraded the trailer, which I will go through later on in this test. A true test of a boat of this size and style is how easy it is to drive both at high and low speeds. The Sniper 444 is excellent in this regard. 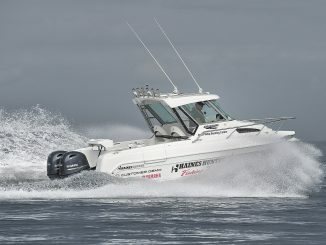 It has great manoeuvrability at low speeds and needs very little trimming once up on the plane to get to that sweet spot where the boat almost steers itself. Although the test day didn’t offer any sort of rough water, we did have a few ski boat wakes to deal with, and the Sniper hull dealt with them with ease. Stability at rest is also a key factor, and the 444 is as stable a platform as you will find. 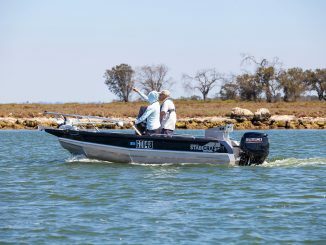 Simon and I peppered a few snags with lures during the test, and the boat was very stable and cruised around well under electric power. You cannot question the fishability of the Sniper 444 Pro. 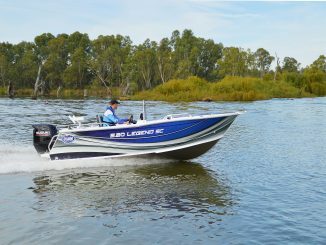 Both casting decks are big enough to be comfortable to fish from, with the forward deck large enough to accommodate two anglers. 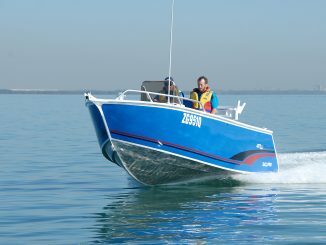 Trolling and bait fishing are also looked after, with rods holders at the rear and comfortable seating to chill out on. There was some simple storage for smaller items in the console and side pockets on the test boat, but not a great deal of other storage. 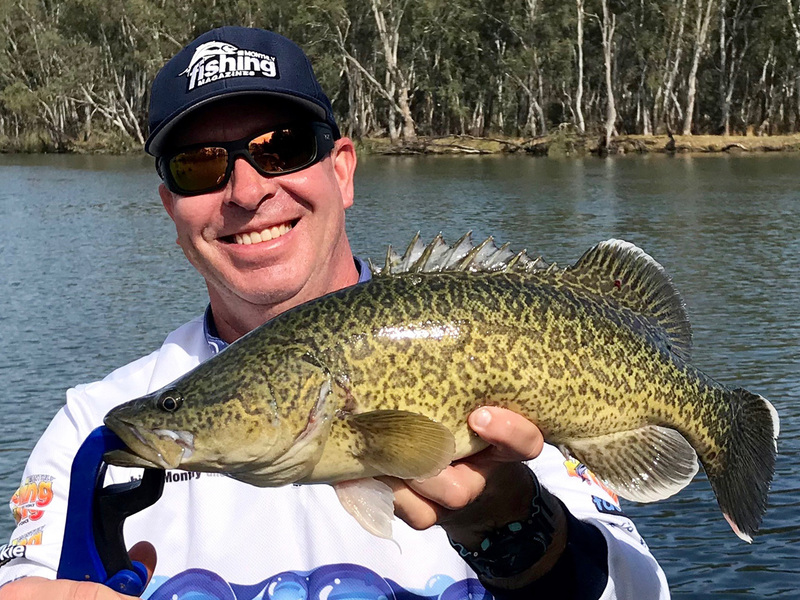 There was plenty of room on the day for two anglers and their gear, but if you plan to fish with more people it’s worth talking to Simon about the different storage options available, including rod lockers. 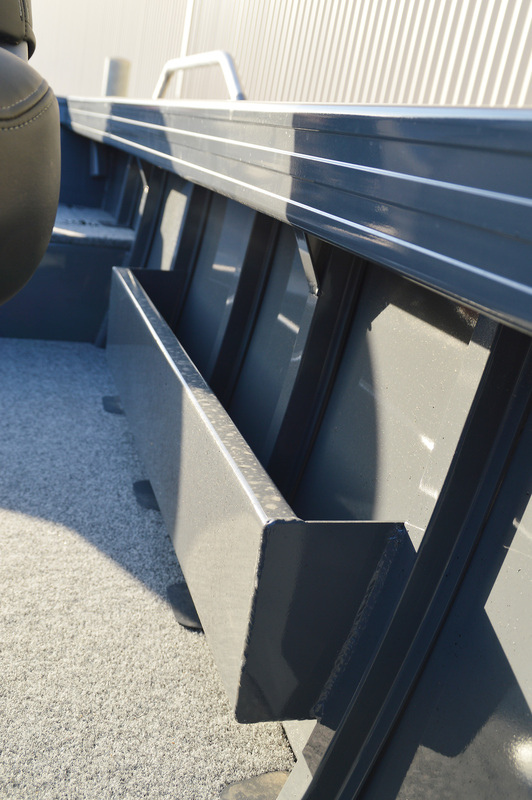 Stability at rest is important in a sportfishing boat, and the 444 is a very stable platform at rest. The Suzuki 60hp 4-stroke was perfectly matched to the 444. It got the boat up to an impressive 54.5km/h. The tested package came on a Dunbier Centreline wide frame braked trailer. 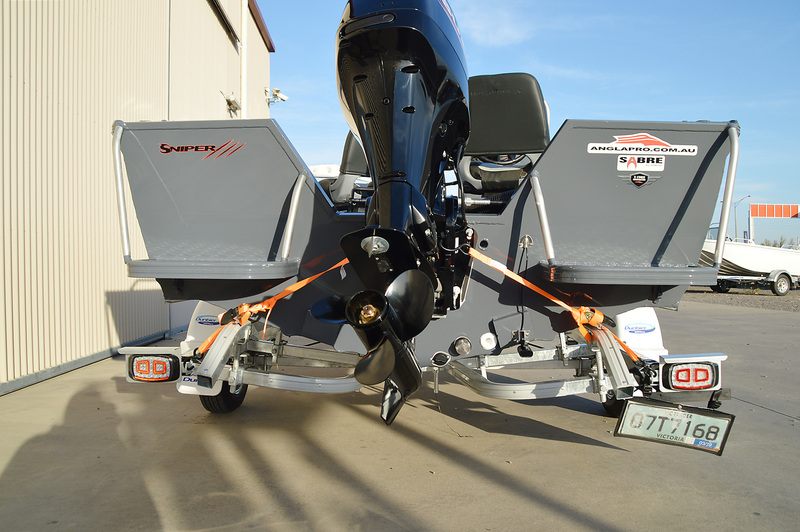 Although a braked trailer is not required for the package, Boats and More are very mindful that all the packages they sell tow, launch and retrieve easily. 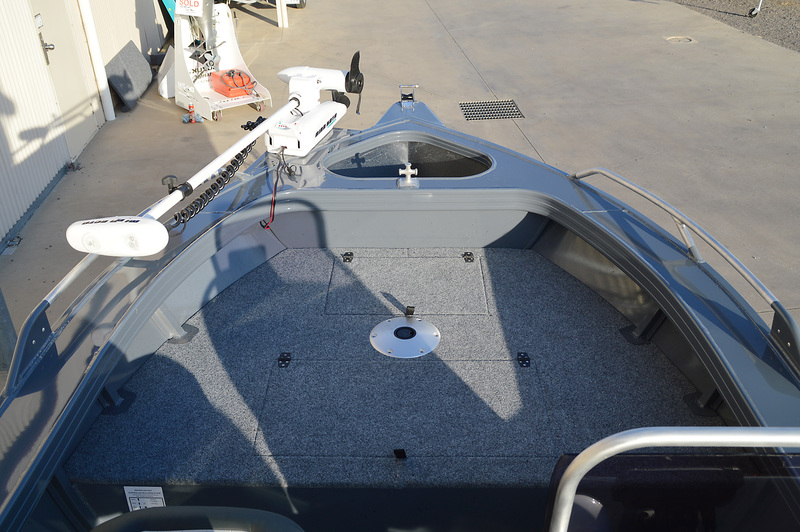 As far as the author is concerned, an electric motor is a must on this style of boat. The test boat had a Minn Kota 55lb bow mount motor, which is ideal for the job. The front casting deck is s good size with battery storage and a kill tank underneath it. It is plenty big enough for two anglers to fish from it. Two side pockets are provided for all those smaller items that you need to get your hands on in a hurry. The console and driver’s seat area was well thought out. There’s plenty of room for electronics, gauges and switches, plus some storage. There’s also plenty of leg space for the driver. The anchor for the boat is kept well out of harm’s way. 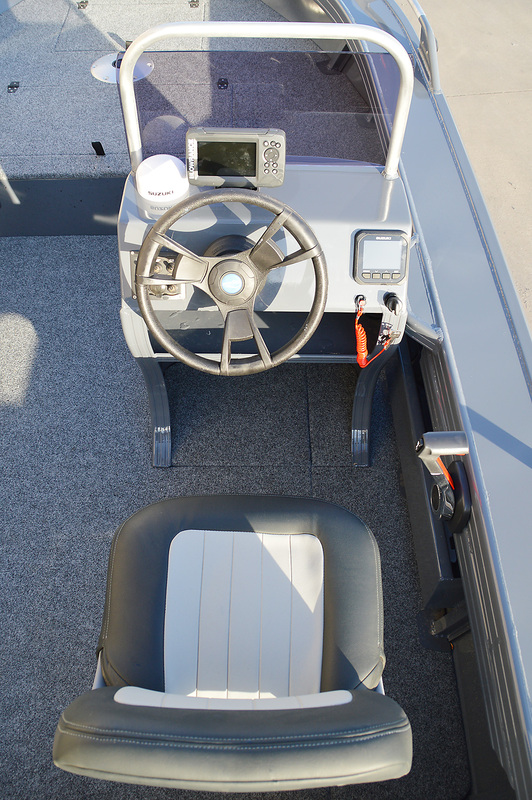 The rear of the boat and console has space to burn. There’s room to store items out of the way and a couple of comfy seats. The Suzuki 60hp provided a great combination of power and economy. The best economy was at 4000rpm. You got 4.8km per litre of fuel burned at 31km/h. The view from the back of the boat shows the vee-hull with decent reverse chines. These explain why the boat handles so well and has great stability at rest. The author with a beautifully coloured Murray cod. It’s always nice to have the opportunity to fish when doing boat tests, and it’s even better when you catch something! 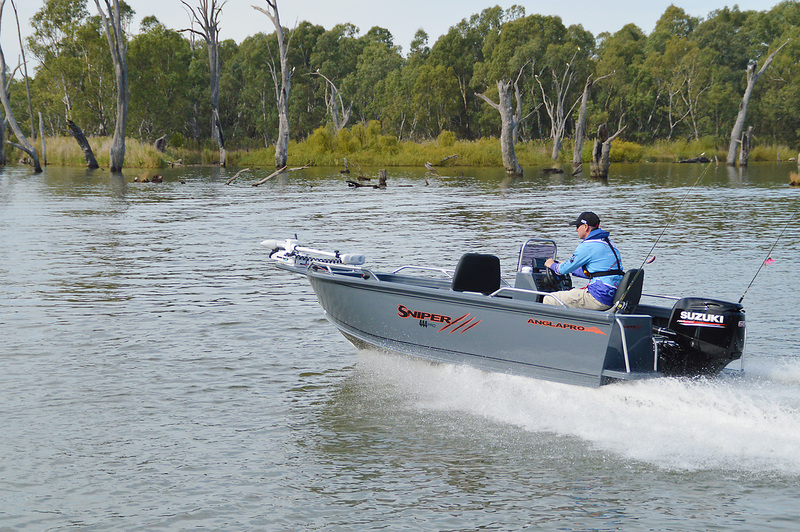 The Anglapro Sniper 444 Pro is on the cusp of needing a braked trailer. 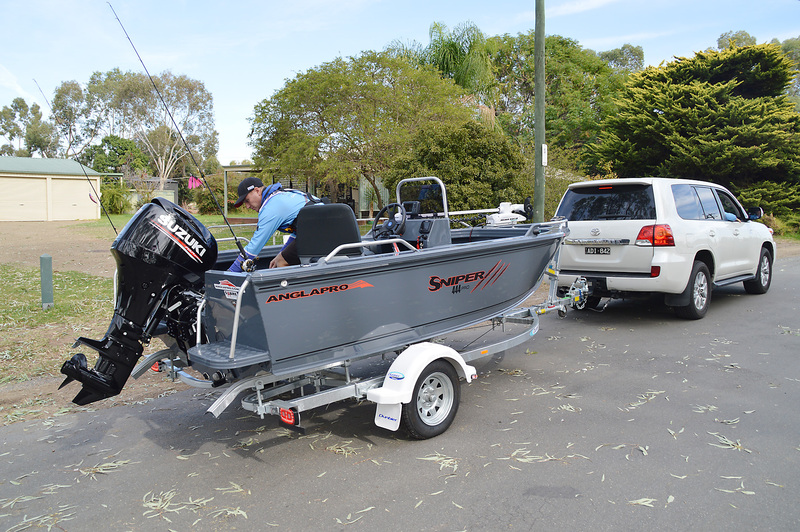 Simon explained to me that although it increases the cost marginally, they like to ensure the trailer under any of their packages provides the best towing, launch and retrieve and storage of the boat as possible. So, although not needing a braked trailer, the tested boat was on a Dunbier centreline wide frame braked trailer. The package can easily be towed with a family sedan, and we drove the boat on and off the trailer with ease. Launching and retrieving with one person would be very achievable. It’s always a pleasure to drive a boat with a well matched motor. 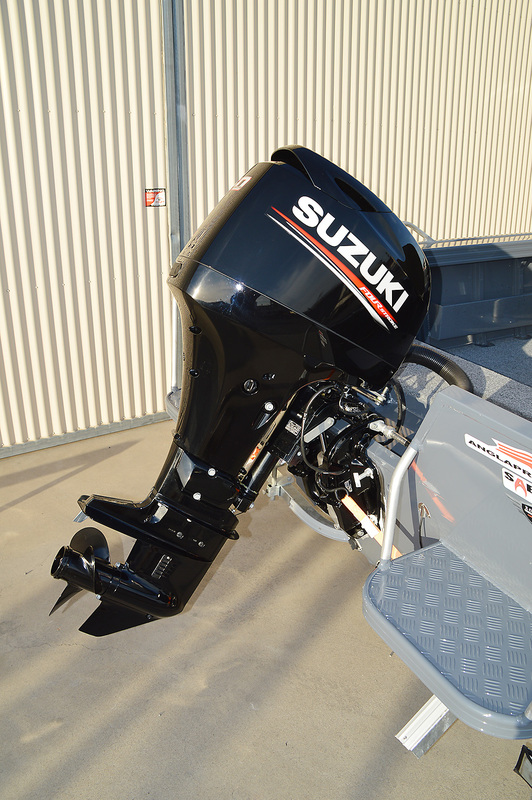 The test boat was powered by a Suzuki 60hp 4-stroke, which is the maximum horsepower for the 444. Simon said they have sold packages with a 50hp, but the 60hp is the perfect fit. The Suzuki also provided some solid performance figures. The best return was at 4000rpm; the motor was getting 4.8km per litre of fuel burned at a speed of 31km/h. It could also get up and boogie, with a top speed of just under 55km/h. The Sniper 444 Pro ticks all of the sportfishing boxes. It rides and handles well, has excellent stability at rest, plenty of fishing space, and the Suzuki brings it all together with power to burn. The addition of the Minn Kota is a must have in my opinion, as it opens up so many more options fishing-wise. The BMT package as tested comes in at just under $35,000. 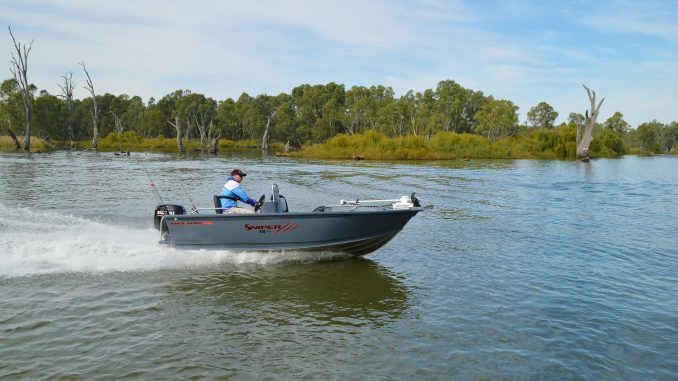 To find out more about this boat and the other Anglapro packages available, you can go the Boats and More website at www.boatsandmore.com.au or contact them on (03) 5822 2108.